The RAVE awards dinner took place April 19, 2016. 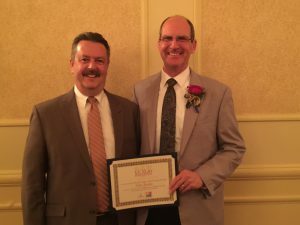 The Junior League of Erie and Get Connected should be commended for this first-class event – Recognizing Achieving Volunteers in Erie (RAVE). Sean Lafferty, WJET-TV news anchor, served as emcee. John Rushe, on of our agency principals, was nominated as an outstanding volunteer in the Adult Class for his work with (a.) the Erie Together anti-poverty movement; and (b.) St. Stephen’s Episcopal Church. Congrats to the Adult Class winner – Beth Racine, a 30-year volunteer at TREC, the Therapeutic Riding Equestrian Center! We have re-designed our websites! Check out www.wrins.com. This was a collaborative effort of Papa Advertising Inc. and Computer Solutions, both of Erie PA. We hope you find our full website easier to navigate. And we feel certain you will enjoy our “new look” featuring scenes from Presque Isle State Park. Our mobile website, as you might expect, makes it possible to easily connect on-the-go. But we made a special effort to envision using it in front of a damaged home; at a roadside dealing with a disabled vehicle; or at the scene of an auto accident. This includes an Emergency Services button. After all, we need to be at our best when your circumstances are at their worst. This re-do also enables us to show off the new 24/7 dispatch feature for Road Service from Erie Insurance. Who Do You Call When Your Car Is Disabled? People think about calling their Auto Insurance carrier when an accident occurs. But what if your vehicle is simply disabled, unrelated to an accident? Many policies have Road Service coverage. And Erie Insurance just enhanced that protection to offer 24/7 dispatch service. Simply call 1-800-367-3743. They can find a local service provider and the invoice (limits apply) will go directly to Erie Insurance. This is “emergency” service such as a jump-start; fuel delivery if out of gas; tire change; key lock-out; winch-out from a roadside ditch; and towing to the closest qualified repair facility. So…how much coverage do you need? First, do not expect your landlord to cover your Contents – clothing, furniture, appliances and electronics. Second, look beyond the fact you were given some of your belongings; you discovered it at a phenomenal price at an estate sale; or you pushed through Black Friday crowds to buy it at “80% Off”. You need to think about the shopping trip of your lifetime. How much would it cost to replace every item you own, at today’s prices, throughout your rented home? We have a Household Inventory brochure that may be helpful. In a previous blog directed at traditional home owners, we recommended Replacement Cost coverage for Personal Contents. We make that same recommendation for renters. Assuming you have a covered loss, you will still have to pay a deductible. This is the amount you agreed to pay before the insurance coverage takes over the process. Also, expect some limitations and exclusions for Special Contents such as jewelry, business-related items, guns, collectibles and some other high-value or unusual items. This is a reminder to talk to us about those valuables. You may be pleasantly surprised by affordable special coverage.